Are you taking your teeth for granted? Do you know the warning signs of Alzheimer’s disease? What’s the difference between anxiety and an anxiety disorder? The newest issue of NIH MedlinePlus the Magazine is filled with information from the National Institutes of Health that can help you take better care of yourself and your loved ones. A retired nurse took quick action when she suspected she had Alzheimer’s disease. It made a difference. Her experience is part of a cover story on Alzheimer’s disease that includes questions to ask your health professional. Coronary artery disease is the nation’s number one killer. A man who exercised every day and ate a balanced diet thought he was in perfect health. He wasn’t. A feature section on coronary artery disease explains the signs, symptoms, diagnosis and treatment. An auctioneer, who obviously has to do a lot of talking in his work, is urging people to take care of their teeth. He learned the hard way why that’s important. His story is part of a feature on fighting gum disease. Check it out to learn the symptoms, risk factors, and treatment. Anxiety is a normal reaction to stress. But when anxiety becomes an excessive, irrational dread of everyday situations, it becomes a disabling disorder. A feature section explores phobias and anxiety disorders which affect millions of Americans. Clinical trials are scientific studies that try to find better ways to prevent, screen for, diagnose, or treat disease. A feature section on clinical trials explains what these studies are. 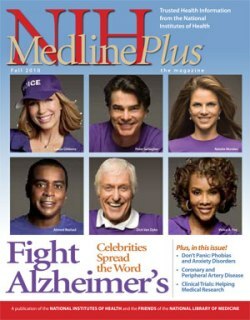 NIH MedlinePlus the Magazine is published quarterly in print (subscriptions are free) and on the Web. October 14, 2010 in Products.